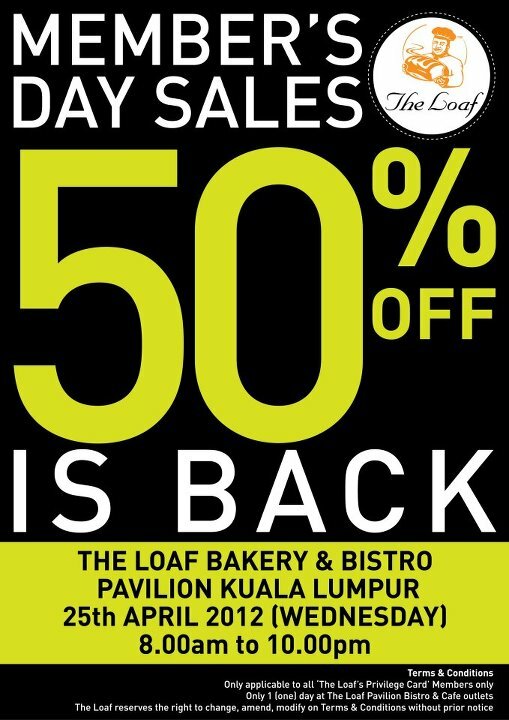 The japanese bakery from our beloved Dr. M is having a ‘grand sales’ today (25th April) at Pavilion outlet all day long (8am - 10pm). Be there early to avoid the crowd. The offer is valid for all items in both bakery & bistro. We really love the cranberry cheese bun, tuna pastries, and rich Campagne Fromage, also the raspberry Motoko jam are not to be missed. From dining menu, the smoked salmon salad, pasta, frozen coffee and Hana roll cake is a must! Nonetheless, do note that the bistro’s menu for the day has slightly less choices as compared to the normal days. Coming soon Member Day sales on 16-May-2012 at Bangsar Village II. This entry was posted on Wednesday, April 25th, 2012 at 10:37 am	and is filed under Bakery, Cafes, Food Promo, Heavenly Klang Valley Food. You can follow any responses to this entry through the RSS 2.0 feed. You can leave a response, or trackback from your own site. « Sector 7 - Insider News!